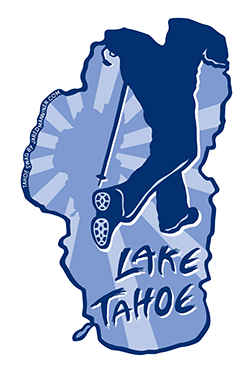 You’ll be hard-pressed to find the trail to Captain Pomin Rock on any maps of Lake Tahoe. It’s not that the location is inaccessible or covers difficult terrain, it’s simply not that popular of a hiking trail. That said, hiking to Captain Pomin Rock is totally worth the relatively minimal effort required to reach it. The trail is technically not even three total miles (out-and-back) and, although you’ll have to negotiate around 650 feet of elevation in that mile and a half (one-way) hike to the rock, even that’s easily accomplished by anyone with an athletic bone in their body. 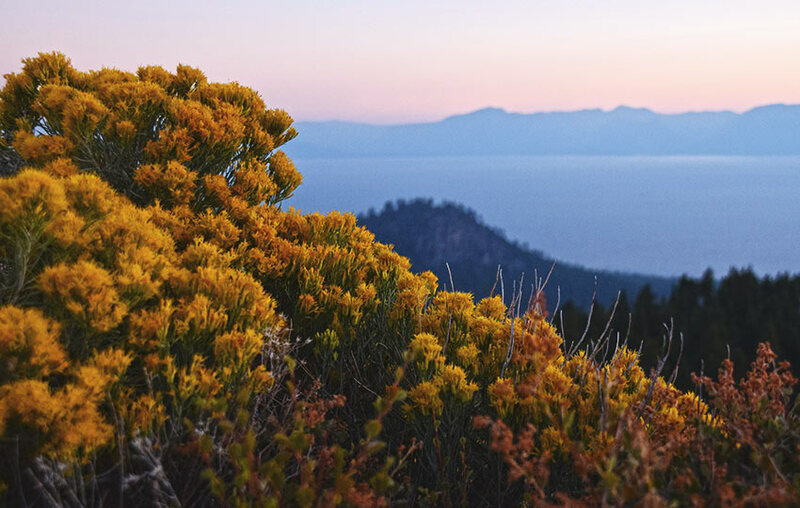 The reason I say the hike is worth your effort is because the parking is free and easy, and once you scramble up to the summit of Captain Pomin Rock, you’ll be rewarded with commanding, panoramic views of Lake Tahoe. Click on the above map to enlarge it for better viewing and printing. This map is only for reference and shows the general route along the Captain Pomin Rock. Always carry a traditional topographic map and compass when traveling in the backcountry. Parking for access to the trail to Captain Pomin Rock is located near Spooner Summit, roughly at the junction between NV 28 and HWY 50. There is a small parking area (that looks like a frontage road) on the southwest corner of the intersection (just north of HWY 50 on NV 28) that you can park at. Pull into the paved area from NV 28 and park anywhere along the small road. The trailhead to Captain Pomin Rock is about 250 feet south from the t-intersection of the parking area. Please note that this paved area is a multi-use location. It functions as the Spooner Summit Watercraft Station in the summer, as well as an aid station location for both of Bike the West’s bicycle rides around Lake Tahoe (America’s Most Beautiful Bike Ride and Tour de Tahoe). I also imagine heavy equipment gets staged at this location for use during road construction season. In the winter, people park here and sled down various aspects of the hillside adjacent to the parking area. With that said, understand that this area may be off limits during various times of the year. If you find yourself in this situation, go hike to South Camp Peak or around Spooner Lake instead. Here’s a map to help you find the parking and trailhead for the trail to Captain Pomin Rock, although the locator pin is technically pointed at the Watercraft Inspection site. The trailhead to Captain Pomin Rock is an unmarked footpath that leads directly uphill from the parking area. This footpath begins about 250 feet south from the small t-intersection in the parking area. See the map at the beginning of this article for an illustration if this description seems confusing. Begin hiking uphill along the footpath. In about a tenth of a mile up the trail you’ll encounter another footpath that runs mostly perpendicular to the trail you’re currently on. Continue hiking straight along the same trail you set out on. Off to the right probably intersects with the small dirt road (that you’ll eventually hike along for a short distance). I don’t know where the trail that leads to the left goes, but I suspect it just winds its way back down to the parking area. Continue hiking straight along the trail for a couple hundred more meters until you reach a large rock outcropping with various rock climbing bolts set in the granite walls. Stick to the right of this outcropping and find your way to the dirt road just beyond the rocks. Take a left (south) on the dirt road and follow it for a few hundred more meters. You should see another footpath that leads off to the right (westerly direction). Follow this footpath through the forest and stick to it for the remaining distance to Captain Pomin Rock. Once you reach Captain Pomin Rock (you’ll know you’ve reached it because it’s a massive outcropping of granite), hike around to its backside and find the path that leads to its top. Be very careful when climbing up this rock as there are a bunch of tripping hazards and lots of sand covering stone, which creates slipping hazards. For those reasons, I would keep a really close eye on your young kids and less-than-sure-footed friends.